Posted by capittsley in Archives, digital collections, history, New Resources @ CSL, updates. In 1936 Governor Wilbur L. Cross penned what is widely regarded as one of the most lyrical Thanksgiving Proclamations ever written. A former English Professor and Dean of Graduate Studies at Yale, Cross was elected as Connecticut’s 71st Governor in 1931. He served four terms and was defeated by Raymond E. Baldwin in 1938. It was his 1938 proclamation however that is a real treasure, as he was filmed reading it on December 9, 1938. It was the first time a Connecticut Governor had ever appeared in a sound film. The Connecticut State Library is proud to bring you that historic film and all eight of Governor Cross’s official Thanksgiving Proclamations. The film can be viewed on our YouTube channel and the proclamations can be viewed in our Flickr collection. On behalf of the staff and board of the Connecticut State Library, Have a Happy Thanksgiving! Posted by kabery in Archives, digital collections, genealogy, history, New Resources @ CSL, newspapers. The Connecticut State Library is pleased to announce that it has received an award of $274,034 from the National Endowment for the Humanities for a two-year National Digital Newspaper Program (NDNP) grant to digitize historically significant Connecticut newspapers. The digital images will be included in the Library of Congress’ newspaper site: Chronicling America. Following the NDNP guidelines, the $274,034 grant will allow Connecticut to add 100,000 pages, digitized from microfilm of newspapers published in the state between 1836 and 1922. An advisory committee consisting of an historian, journalist, educator, librarian, and archivist will select the newspapers to be scanned. “This is a great honor for Connecticut – a state where newspapers have always been important,” said State Librarian Kendall Wiggin. 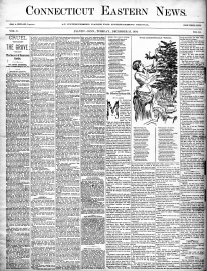 Wiggin noted that while Connecticut boasts the nation’s oldest continuously published newspaper, the Courant, by 1875, there were 78 newspapers being published in the state, including 17 dailies and 51 weeklies. This project builds upon the earlier Connecticut Newspaper Project (1991-2002) which inventoried the state’s newspaper repositories, cataloged the newspapers and preserved over 1,000,000 pages of 437 newspapers on microfilm. The State Library has already worked with digitizing newspapers through its Newspapers of Connecticut project. This has short runs of 86 titles from 1821-1929, for a total of 3,243 issues from 31 towns. Posted by aramsey in Archives, digital collections, history. The Connecticut State Library has recently completed the digitization of a portion of the photographs from the Herbert Randall Survey of New Haven and Environs, 1880-1920 (PG 380), which is now available in its digital collections. This collection consists of approximately 141 black and white photographs of New Haven and surrounding areas. Most of the photographs are street scenes from the downtown area. Herbert Randall (1850-1926) was born in Massachusetts and lived in Ann Arbor, Michigan before opening a studio in New Haven in 1894. He served as a contributor and later as president of the Connecticut Magazine and sought to promote public awareness of the history of Connecticut. From time to time the Connecticut State Library hopes to add to this collection. Posted by aramsey in Archives, history, Museum. “Follow the Blue Blazes”: Connecticut’s Hiking Trail System exhibit opened this month in Memorial Hall at the State Library’s Museum of Connecticut History, 231 Capitol Avenue in Hartford. The exhibit documents the Connecticut Forest and Park Association’s role in creating, maintaining, and making hiking trails accessible to the general public through programs like Connecticut Trails Day. Included in the exhibit are maps, trail folders, patches, trail signs, booklets, and photographs. The Connecticut Forestry Association, later named the Connecticut Forest and Park Association, was founded by a group of concerned citizens who met at the Weatogue home of Reverend Horace Winslow on December 30, 1895. The association’s leadership voted on October 5, 1929 to establish a Trails Committee to administer the trails system. Today, the Blue-Blazed Hiking Trail System is approximately 825 miles of trails maintained by hundreds of volunteers working in cooperation with many public and private landowners. All of the items in the exhibit are part of RG 169:007, Connecticut Forest and Park Association records which were donated by the Connecticut Forest and Park Association to the Connecticut State Library on December 17, 2012. The exhibit may be viewed Monday through Friday 9:00 to 4:00; and Saturday 9:00 to 2:00 through August. All exhibits are free and open to the public. Posted by capittsley in Archives, digital collections, history. 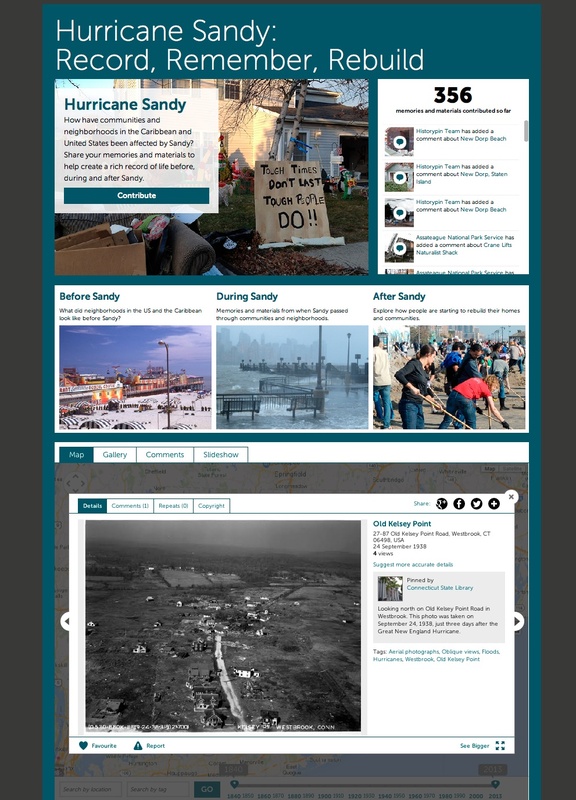 Connecticut State Library is proud to announce our participation is the newest Historypin project, Hurricane Sandy: Record, Remember, Rebuild. Together with Google, the Metropolitan New York Library Council, the Society of American Archivists, and the American Association of State and Local History, the project is a shared online collection of local history as captured by individuals and cultural heritage institutions alike. Connecticut State Library has pinned our oblique aerial photos showing the damage from the Hurricane of 1938. These images give a great sense of what the shoreline and river communities looked like almost 75 years before Sandy. You can read more about the project on the Historypin blog. If you want to get involved you can share your own stories, find out how to set up a school or community event, or add an institutional collection to the Hurricane Sandy project. Posted by aramsey in Archives. The State Library recently had this new volume printed and sent copies to all public libraries, libraries of institutions of Higher Education, and the State Documents Repository System. A limited number are available for purchase until the supply runs out. Each volume costs $25.00 plus state sales tax and postage. If you wish to have a copy, please contact the State Archivist via e-mail (mark.h.jones@ct.gov) or by letter sent to Connecticut State Library/231 Capitol Ave./Hartford, CT 06106. Provide your name, mailing address and the number of copies that you want. Do not send cash, money orders, or checks. A bill will come with the order. The Historical Documents Preservation Fund made this volume possible. The Connecticut State Library has recently completed the digitization of a portion of the photographs from the Connecticut General Assembly Portraits (PG 540) which is now available in the Portraits collection in its digital collections. The collection consists of 192 historical portraits of Connecticut state officials including governors (circa 1862, 1865, 1901-1905, 1925, 1957), constitutionally elected officers (circa 1844-1866, 1901-1912, 1919-1924), executive branch officials (1889-1957), General Assembly members (circa 1844-1957), and General Assembly committees (1889-1935). From time to time the Connecticut State Library hopes to add to this collection. The Connecticut State Library has recently completed the digitization of the Chauncey Hosford War of 1812 papers, which is now available in its digital collections. During the War of 1812, Chauncey Hosford (1784-1855) enlisted as a first lieutenant in Capt. Elizur Warner’s Company of the United States Infantry Thirty-seventh Regiment on April 30, 1813. His prior military service included a commission as ensign in the Third Company of the Fourteenth Regiment of Connecticut Militia as of April 28, 1810. The Thirty-seventh Regiment was stationed at Fort Griswold in New London. Hosford was assigned to the recruiting service and spent much of the time in his home town of Canaan in Litchfield County recruiting men from the area. Most of this collection of 101 items reflects his recruiting activities. Included is correspondence, orders, weekly recruiting returns that list the names and towns of recruits, and receipts for recruiting expenses. Also included is a muster roll for Capt. Elizur Warner’s Company. The Chauncey Hosford War of 1812 Papers was donated to the Connecticut State Library by David A. Gibbs and researched by Rosemary Pereira in 2012 and is part of the David Arthur Gibbs Collection of Hosford and Gibbs Family Papers. Governor Dannel P. Malloy has issued a proclamation recognizing October 2012 as Connecticut Archives Month. This annual event is an opportunity to raise awareness about the value of Connecticut’s historical records and archives as well as the archivists who oversee them. The Connecticut State Historical Records Advisory Board has led the initiative on Connecticut Archives Month since 2005. The Connecticut State Historical Records Advisory Board, with its co-sponsors Conservation ConneCTion and COSTEP-CT, has produced its second poster promoting Archives Month. 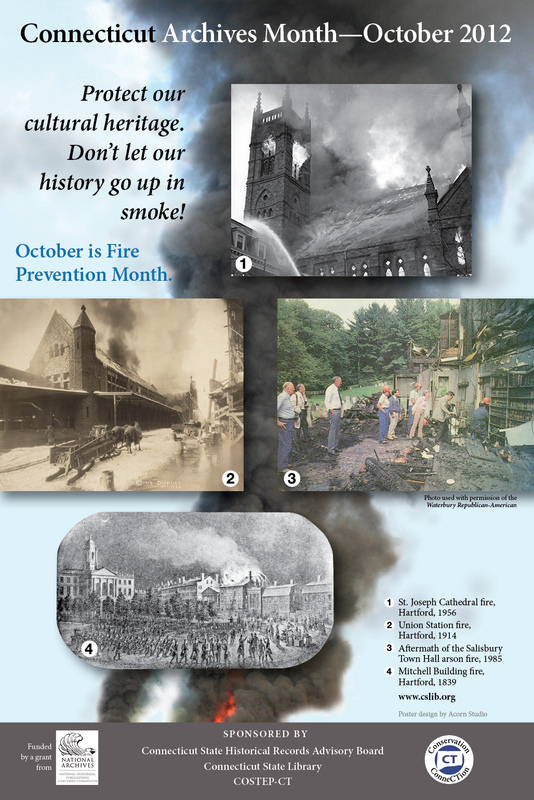 In addition to being Archives Month, October is also Fire Prevention Month. The theme for the 2012 poster is Protect our cultural heritage. Don’t let our history go up in smoke! The poster is funded by a grant awarded to the Connecticut State Library from the National Historical Publications and Records Commission (NHPRC) on behalf of the Advisory Board. The State Library is distributing the poster free of charge to public and academic libraries, town clerks, historical societies, museums, and firehouses across the state. If individuals or other groups who would like a copy may contact Mark Jones at the e-mail address below. The Advisory Board and its co-sponsors are urging local historical societies, museums, public libraries and archives repositories across the state to draw up disaster preparedness/recovery plans. These plans should include a pre-fire planning tour by the local fire department. For the third consecutive year, the State Library will post announcements of activities by historical societies, museums, libraries and archives on its website. If your organization is planning to host an Archives Month event, workshop, conference, or exhibit, please contact State Archivist Mark H. Jones at mark.h.jones@ct.gov. For more information and resources about American Archives Month visit the SAA American Archives Month 2012 website and the Council of State Archivists American Archives Month website. Posted by capittsley in Archives, digital collections, history, updates. The Connecticut State Library is pleased to announce the completion of the WPA Architectural Survey digitization project. We have just added the final twenty-two towns to our online collection of historic homes and buildings. The newly added towns are Wallingford, Warren, Washington, Waterbury, Waterford, Watertown, Westbrook, West Hartford, West Haven, Weston, Westport, Wethersfield, Willington, Wilton, Winchester, Windham, Windsor, Windsor Locks, Wolcott, Woodbridge, Woodbury, and Woodstock. Digitized materials include survey forms and photos from the Census of Old Buildings in Connecticut. Also known as “The WPA House Survey”, the project took place from 1934 through 1937 under the Works Progress Administration (W.P.A.). The survey forms provide descriptions of nearly 5,000 buildings. Photographs were taken of most buildings and clipped to the survey forms. Some forms also include sketches of interior and/or exterior architectural details and a brief history of the building.